Thank you once again for all your help and you surely helped my stay in Kharkov be a very enjoyable one. It was a pleasure meeting you and your husband and I hope you are all doing fine. I'm keeping touch with Oksana and little by little we're getting there, she's a lovely girl and I want very much to progress our relationship. As I talked with your husband, I will be in touch as soon as I know when I can return in Kharkov. Congratulations on the seriousness of your agency: punctual, precise and serious! For a new agency in Kharkov, "Cher-Ami" presents a very interesting catalog of charming ladies. The website is very pleasant, and nice to look. The profile of ladies are easy to consult, and all the articles for the different services, the possibilities of payment, or to join the managers, are well-documented. Thanks to him for his devotion when I came in February ! My name is Victoriya. I have started my search on the Internet from December 2007.I was registered in few agencies,including EM, city of brides. I received a lot of letters. Many men was interested in me, but after 2-3 letters I understand, that all of them are not serious and even don't remember who I am. I already didn't believe that I choose good way for my search and that all agencies only try to earn money. After some time I have found in Internet Kharkov marriage agency "Cher ami". I have decided to try it also. because it is in my city and I can go in their office myself. I like the team of this agency and believe again that I can to find my love. After 4 weeks I already had result. I had correspondence with Aaron, he was very interesting in me and after 2 month of our correspondence and few phone conversations, he decided to visit me in Kharkov. It was really very big surprise that young man 28 years old is such serious and ready to come from Australia to meet me. Our first meeting was fantastic. 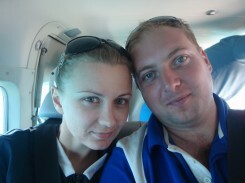 We spend 2 weeks in August of 2009 in Kharkov and had very good romantic time. I just have understood, that he is my soul mate. But for me was very difficult to understand, how we can build relation, if we live in different parts of world. Aaron invited me in Australia in May, so I thought that we maybe forgot each other after 8 months. But we talked by the phone and Skype every 2-3 days and finally on May holidays I went in his country. Aaron helped me with all - to make passport, documents, visa and send me tickets. I am very happy that I have found forces to fly by the half of world for the sake of our happiness. We spend 2 weeks there , as 1 day. I didn't want to go back to Ukraine, but I need it. I need to open visa of the bride and fly to marry in Australia with my Aaron. We had very difficult way, but now we are happy. Thank you very much that you found for me my happiness. Thank you so much to your team and company, I really like your services and you really have competitive prices and the ladies i have been in contact with so far are seem genuine with the good intentions unlike many other websites full of scammers. I will recommend your website to my friends as well and make good publicity on the internet for your company, which is not so well-known. Apr?s la d?couverte du site CHER AMI et un entretien t?l?phonique avec Christophe, j'ai d?cid? de m'inscrire sur le site, parce que j'avais reper? une fille nomm?e Tanya. De qui par son profil me semblait tr?s int?r?ssant pour ces points communs. Nous nous ?changions des lettres et je lui ai t?l?phon?, peu de temps apr?s je suis all? la rencontrer ? Kharkov. Mer?i Nataliya et Christophe pour votre travail, votre professionnalisme, votre sympathie et surtout de m'avoir permis de rencontrer Tanya, qui a pour moi dans ces yeux, un plus que les autres n'ont pas. Ce fut un agr?able s?jour que je vais r?it?rer prochainement pour la revoir. La suite est ? suivre!!! I have been in Ukraine and visited Nataliya and Chris to establish both a future wife and to support other men from New Zeland in their search for a lady. I found the agency very friendly and sincere in their work. They go out of the way to establish a couple meeting each other. I have found my bride to be on your website and I want you to know that you run an excellent website. Thank you for your time. Sincerely, Alain C.
After discovering the website cher-ami.net I started correspondance with some women by email. This site does not present thousands of ladies, but they present serious and high quality ladies, I understood it after. My trip to kharkov with orgaisation of meetings was then organised. The managers of cher-ami took care of my transfers and accomodation. Everything was perfect. They picked me up everyday for the meetings. the interpreter was very helpful because she knew the ladies and she could advise me during the meetings. She has facilitated the conversations. I have been lucky enough to meet my "pearl" during my first stay in Kharkov. I can only advise men to use the services of Cher-ami, the organisation and the personnalised accompaniement during the meetings has been very helpful. If I can give one advise to future travelers to Ukraine : don't fly there with any fixed ideas about this country and its citizens. Discover it and them with humility. Ukraine is a country full of differences. Ukrainian women can give a lot of lessons of courage and sincerity to french women. Dear Cher ami. I don't know how I can to say thank you for our service. I didn't hope on any happiness, when was alone with 2 children. But I have found Chris and life is nice now. THANK YOU! Dear Viktoriya! Thank you very much for your servises. Thank you that the hope has revived. I have not married yet, I communicate and I meet my man, I want to learn more about man and his country. did not want the conversation to end. I wish you all much success. Once Yulia and I are marriage in America we will let you know of our joy and happiness.